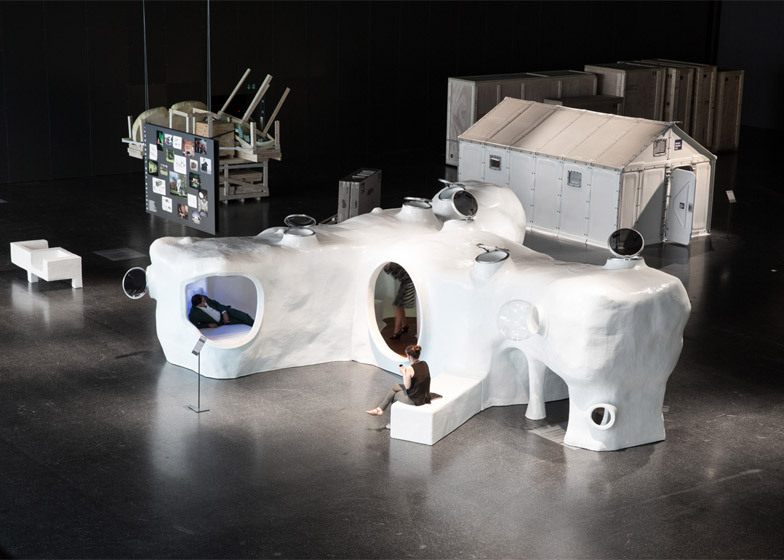 Design Miami/Basel 2015: this inhabitable sculpture by Dutch studio Atelier van Lieshout is a cross between a luxury lounge and a primitive dwelling (+ slideshow). Unveiled at this week's Design Miami/Basel fair, the organically shaped fibreglass structure is designed to house a fictional tribe. 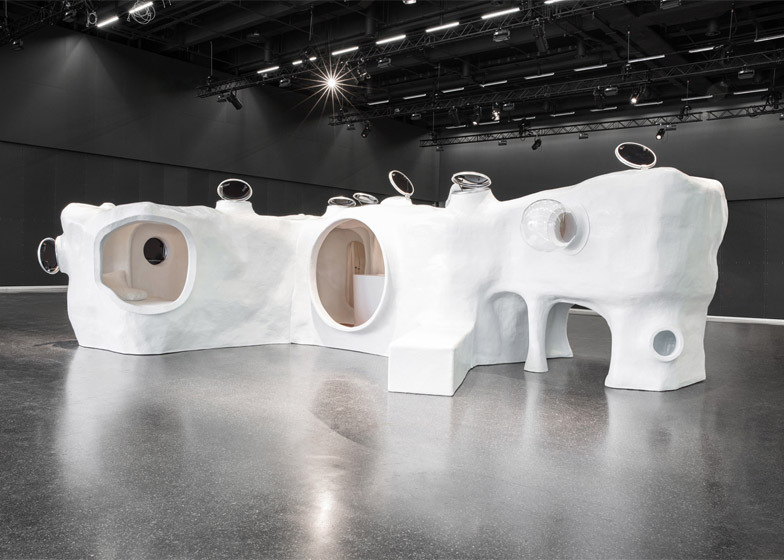 "The Original Dwelling is part of the ongoing series New Tribal Labyrinth which presents a vision of a future, yet primitive, world inhabited by imaginary tribes where there will be different ethics," said the studio, which is led by artist Joep van Lieshout. The white sculpture measures approximately ten by seven metres, and includes a bedroom, a playroom, a bar, a lounge and a dressing room. 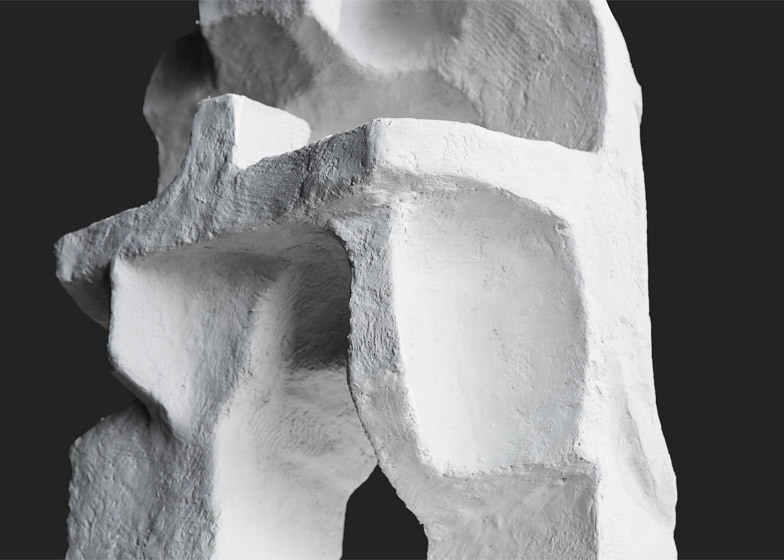 Each of the internal spaces is dictated by the external form, and appears to be carved out from a solid piece of material, similar to cave formations. 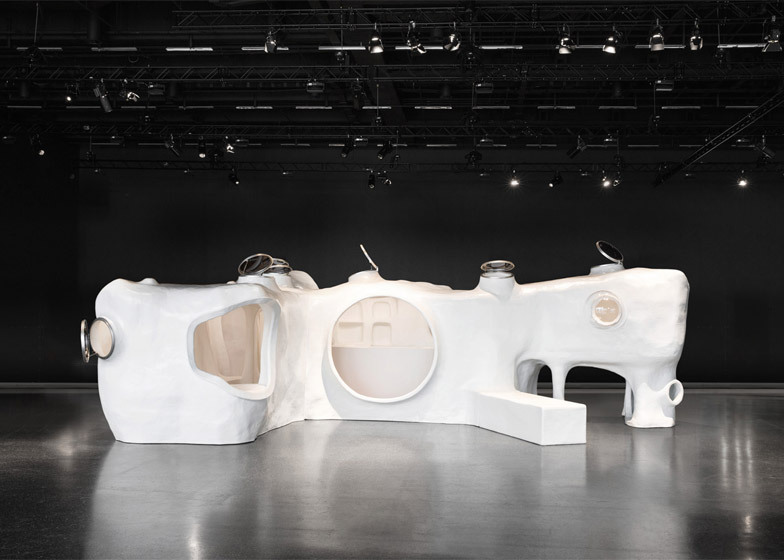 "The work takes humankind back to its origins, recalling a primitive state of being," said Atelier van Lieshout. Large openings in the pavilion's skin allow visitors to clamber inside, where extra daylight is provided by porthole windows scattered across the walls and roof. Wooden planks cover sections of the floor before it gently slopes into the walls and curves over to form seating areas. 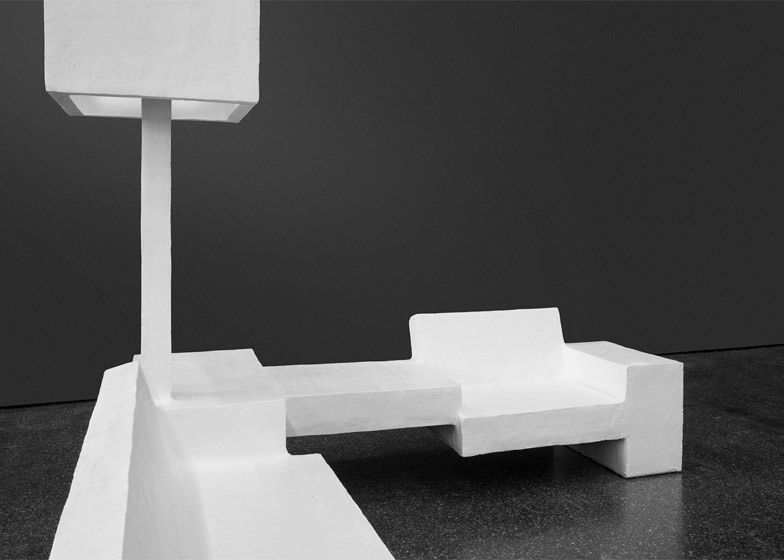 On the exterior, a portion of the volume is raised off the ground to create a sheltered space underneath, while part of the wall extends out to form a bench beside the doorway. "The Original Dwelling makes a link with the Modernist Movement, but its organic shapes and primitive production methods challenge Modernism," said the studio. 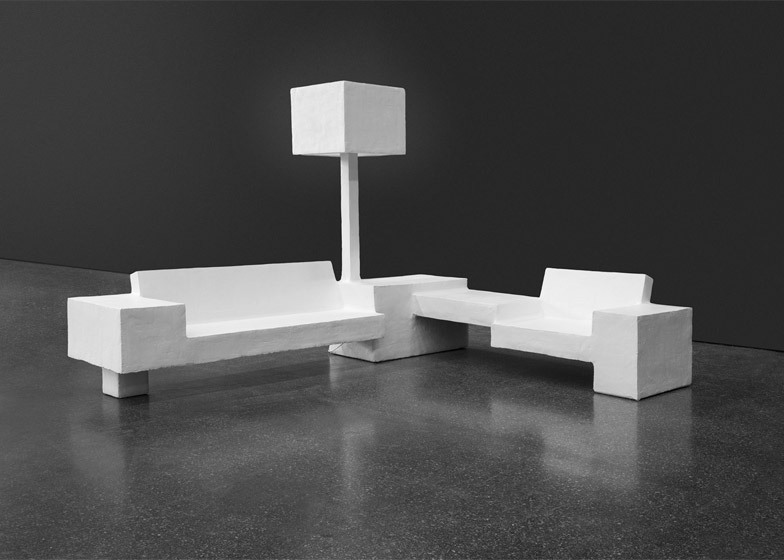 Van Lieshout also created a series of outdoor furniture pieces to accompany the house, in a style that he describes as "nouveau Brutalism". The chairs come in a variety of shapes and sizes, including an L-shaped bench that incorporates a floor lamp. 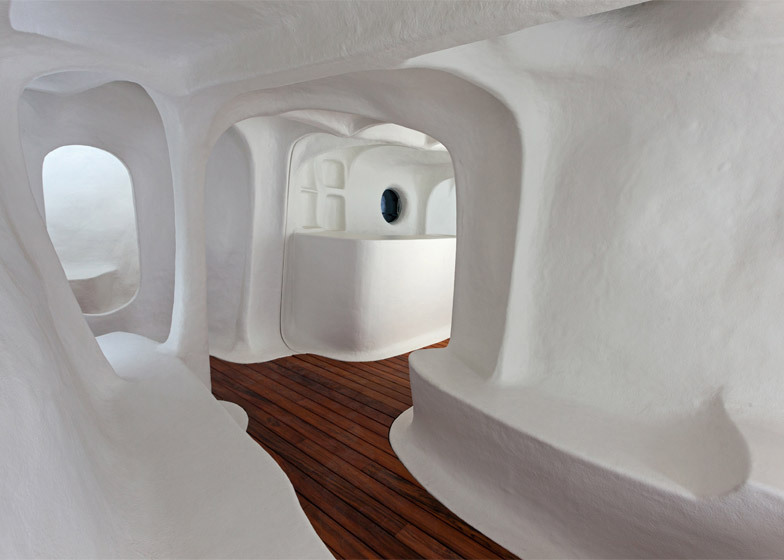 The designs are formed from the same white fibreglass, but have more angular forms than the rounded dwelling. The project is being presented by Carpenters Workshop Gallery – which has branches in London and Paris – as part of the Design at Large section of Design Miami/Basel. 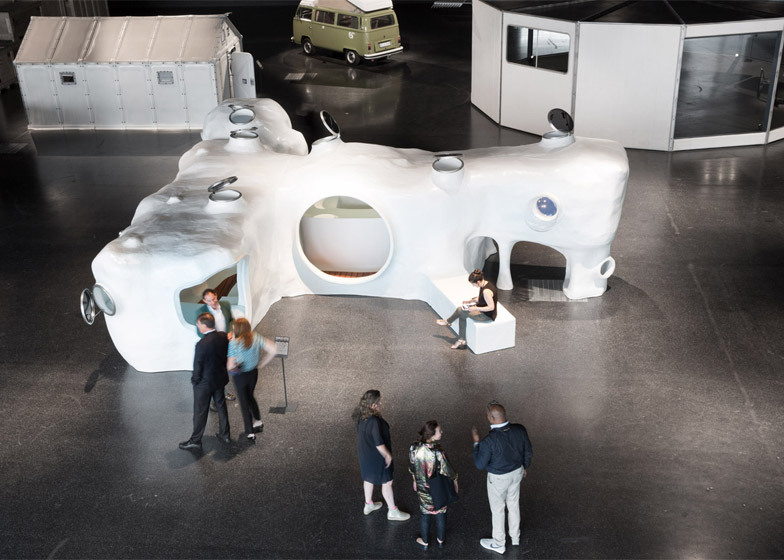 The 2015 edition of the annual design fair runs from 16 to 21 June at the Messe Basel exhibition centre. This year's show also includes Richard Rogers' update of a flatpack house by Jean Prouvé and a blackened-wood VIP lounge by Olson Kundig. 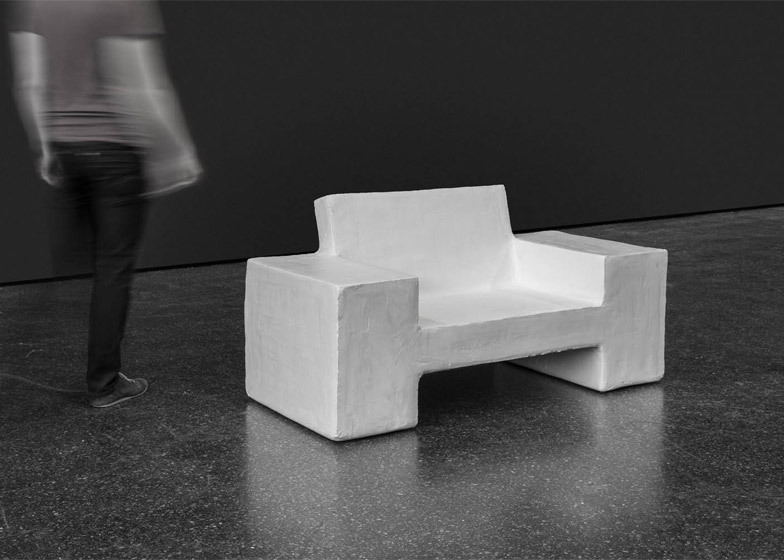 Atelier van Lieshout was founded in 1995 and is best known for its partially abstracted sculptures and furniture pieces. Previous projects include an eight-metre-tall tower of oil drums draped with human figures in Rotterdam and a mobile, indestructible dwelling with an armoured shell.